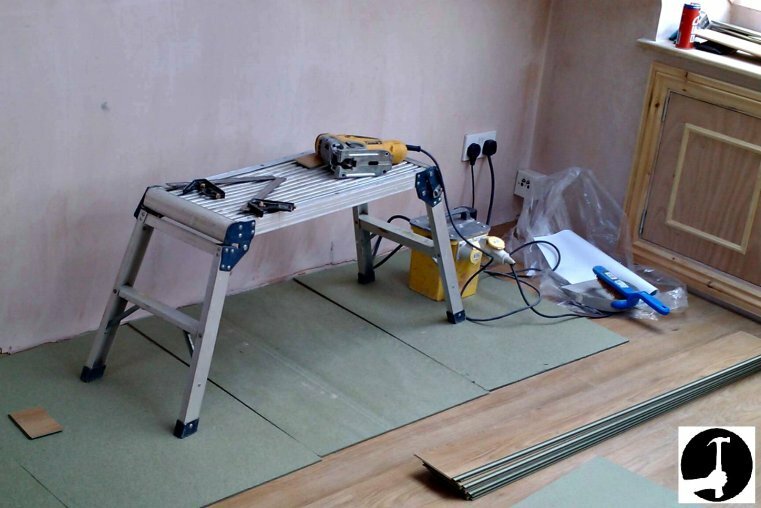 Which are the best Laminate Flooring Tools to use when fitting floating floors? This is a full list of the laminate flooring tools I use to install floating floors to a high professional standard. I have also included tips on how I use them for the different types of cuts needed when fitting laminate floor boards as there are better ways depending on what you are doing. Although the old saying is 'a bad workman always blames his tools' you've still gotta have the right tools for the job! Please don't listen to what some of the DIY websites say about how to cut laminate flooring! Because laminate is a man made material containing glues and resins it absolutely ruins the cutting edges of normal saw blades. Blades blunt quickly and you can burn out the motor of a power saw by trying to cut laminate flooring with the wrong blade or a blunt blade. You should never use a circular saw or miter/chop saw to cut laminate flooring unless you have a very expensive, specifically designed carbide tipped laminate cutting blade fitted to your saw. These blades will last long enough to do the job but they are really only worth buying if you are going to be doing lots of laminate flooring installations for a living because they are so expensive! They will also throw up more dust and the dust from laminated floor boards is not good for you to be breathing in at all, containing many poisonous chemicals and resins that your lungs don't need or appreciate. No.1 on the list is Dust Masks. Apart from the fact you don't want to spend the next two weeks picking black bogies out of your burning nostrils, the dust from wood and man made boards like laminates can cause cancer. Laminates contain all sorts of nasty sh#t you do not want to be breathing in to your precious lungs so make sure you do whatever you can to reduce the risks by wearing a decent mask, keeping the room well ventilated and the dust to a minimum. Cutting the laminate floor boards over a bucket so the dust falls straight in will help and means less sweeping up at the end of the day too. Pretty self explanatory, everyone that owns a toolkit has one. Whilst I use a big chunky one for rough carpentry, for interior jobs like this I prefer using a smaller good quality Stanley tape measure which fits neatly in a pocket. Pencils wear down quickly and when laying dark floors you can't always see pencil lines clearly among the dust when you're cutting the boards. A Stanley FatMax Fine Tip Marker pen is great for marking and it wipes off easy with a damp cloth afterward. The Wood Flooring Installation Kit you can buy from places like Amazon include things like the 10mm spacers needed for the expansion gap, a pull bar like the one on the right and a tapping block . The main thing you want out of the fitting kit is the pull bar, you can use small 9mm ply off-cuts for the gap and a scrap piece of hardwood for the tapping block if you don't want to buy the entire kit. The bar though is essential for getting the last board in and for closing the gaps between the ends of the boards when you don't have enough room to swing a hammer (near walls). It has a soft pad stuck to the bottom so that it doesn't scratch the floor. 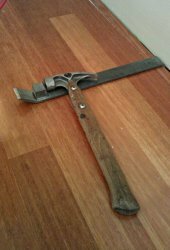 The jigsaw is the best power tool to use to cut laminate floors with for a few reasons. It's light, important because you'll be picking it up all day. Also, the best blades are cheap. Because materials like laminate ruin saw blades instantly, I buy packs of laminate specific jigsaw blades that are cheap enough you can throw them away as soon as they are knackered. I always price at least a couple of packs of these into a job when I'm quoting to lay a floor for someone. I use this almost every day not just for laying laminate floors with but as a scribing tool. 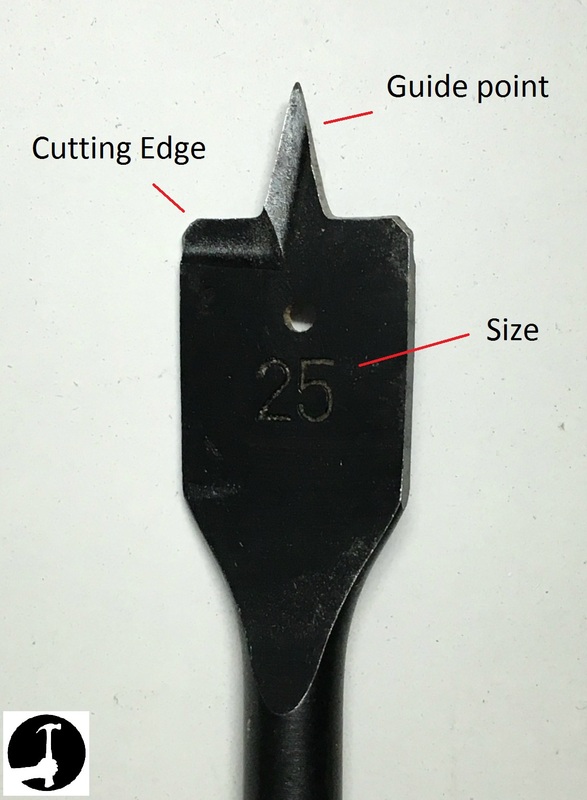 The quickest way to cut or scribe timber perfectly into an awkward/irregular shape is to push this handy profile gauge up to the shape and then transfer it onto the work piece. It doesn't have to be a combination square if you have a try square, or another type that will do the job fine too. I prefer the combination square because as well as marking square lines when setting out, you can set and use the rule to quickly mark parallel lines with it when cutting boards to width. I use auger drill bits when laying laminate floors to drill holes for the radiator pipes. Get some pipe collars that match the wood grain colour and pattern to neatly cover the expansion gap needed around the pipes. Special handsaws are available specially designed to cope with cutting hard laminate materials. I've got a laminate cutting hand saws that I only use when laying wooden and laminate floors. It would take forever if I only used that to cut all the floor boards though, so that's where the jigsaw comes in. The laminate specific jigsaw blades mentioned earlier don't only cut better and last longer, but because they cut on the downward stroke you can do your setting out and cutting from the face side of the work piece. Normal jigsaw blades cut on the upward stroke, meaning you need to mark and cut from the underside of the flooring and cut the boards upside down, or you'll damage the face of the board. Marking out on the back of the board is trickier, takes longer and you are much more likely to make an error. If you need to cut a curved shape or to scribe to an uneven surface again, the jigsaw may be the best tool to use. If the jigsaw is too large, or you will risk breaking the brittle floor with it then a coping saw does the same job without the power and vibrations. Fit the coping saw blade so that the teeth point towards the handle. This means it will cut on the 'pull' stroke, and ensures the frame of the saw is pulled tight at the same time. Because the blade is fine. Whilst it may be tempting to use a circular saw or table saw to rip laminates, unless you have an expensive carbide tipped blade stick with the jigsaw or handsaw. If you have trouble cutting straight lines with a jigsaw then clamp a straight edge (spirit level or straight piece of timber) onto the board. If you don't have clamps, you can screw the straight edge to the waste part of the floor board that will get cut off any way (remember to allow room for the thickness of the blade when doing this). Have a question or comment to to add about the best tools to use when installing laminate flooring?